In lensed this image while exploring and filming the wilderness area between the Aquarius Plateau and Sevier Plateau in the Dixie National Forest, the frozen Sevier River snakes a serpentine path across Johns Valley on the eastern side of the Sevier Plateau above Bryce Canyon National Park and the Escalante Grand Staircase National Monument in southern Utah. Coming down the middle of this image is the Eastern Fork of the Sevier River and the tributaries that fork off of the river to the right is (from the top down) South Creek which becomes Sweetwater Creek then Clay Creek. To the left, the fork is called Hunt Creek. The mountain on the right side top of the image is called Griffen Top and those are part of the Escalante Mountains. And way off in the distance on the horizon to the left of the image is Forshea Mountain and you can see a little bit of Parker Mountain as well. This valley is a beautiful place no matter what time of year, but the winter time when it is blanketed by snow is a very special time when creating this serene and silent landscape. 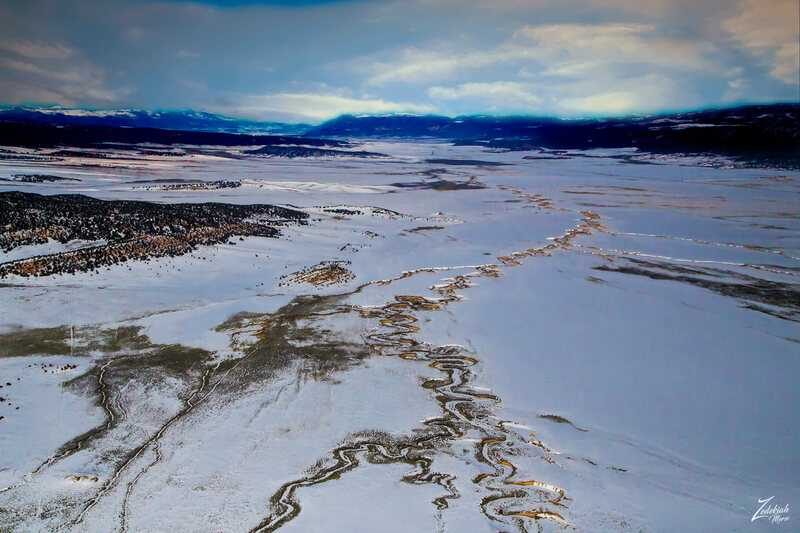 This valley is part of the ancient ancestral homelands of the First Nations Pahvant Ute Tribes. They ranged throughout the deserts surrounding this valley and north around Sevier Lake, west of the Wasatch Mountains, and down south almost to the Nevada border, mixing somewhat with Goshutes and Paiutes in southern Utah. The stories of Sinauf, the god who was half man, half wolf, and his brothers Coyote and Wolf have been told many times in tribal tipis and wickiups. According to Ute legend, these powerful animal-people kept the world in balance long before humans were ever created. After Sinauf made people, humans took responsibility to care for the world, and in time they created many stories of their predecessors. These stories became the basis of Ute history and culture and defined the relationship of Ute Indians with all living elements, both spiritually and physically. Most often the stories were told during the winter months. As snow drifted in under the tipis through little gaps, children scrambled to cover the drafts. By the fire sat the elder, the storyteller. His listeners sat in a circle, bundled tightly in warm buffalo or rabbit robes, waiting eagerly for him to begin what could be a long night of stories. After filling his magic bag, Sinauf closed it and went to prepare for his journey. Among the animals, Coyote was the most curious. In fact, this particular brother of Sinauf was not only curious but contrary as well, opposing almost everything Sinauf created and often getting into trouble. When Coyote heard about Sinauf’s magic bag full of stick people, he grew very curious…I want to see what those people look like.‘ He thought. Sinauf was anxious to complete his long journey, so he did not take time to eat and soon became very weak. Due to his weakness, he did not notice the bag getting lighter. For, through Coyote’s hole in the top of the bag, the people had been jumping out, a few at a time. Other myths tell of the creation of diversity in the land and how various creatures chose their own special places. They also tell how animals and people lost the ability to communicate with each other, drifting into different lifeways. It is nice to imagine the kids sitting around the fire inside the open-topped Tipis telling this story while the children sat, transfixed by the storyteller and the fire, while outside they were surrounded by the very scene you see in this image above.